I've written about dry fire practice previously. For most of my indoor dry fire, the aiming point is typically a small sticky note. Striving to get the sights settled on that 2 1/2" square surely can't hurt but I wanted to use something a bit more representative of a match. I also needed to add more movement to the practices, and that required a little more room, and some more realistic target setups. I recently came across some scaled down targets made by Charlie Myers at C&M Targets. 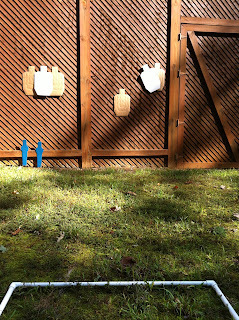 The targets are 1/4 scale, so setting them at 3 yards simulates a full size target at 12 yards. This seemed like just the thing to set up some field courses in a small space. Before I ordered, I had a question about the targets and emailed Charlie. He responded quickly and even sent along his phone number in case I had other questions. Charlie's ordering system is pretty unique, and says a lot about him and the shooting community. After I notified Charlie of my order via email, he sent the targets on the way and followed up with an email with the total cost with shipping; he didn't wait for payment. Naturally I got my check in the mail with equal haste! The set I purchased included 10 USPSA style targets and 4 pepper poppers. The targets have perforated scoring zones, and are even white on the reverse to be used as no shoots. The cardboard is sturdy and I expect it will hold up well under use. 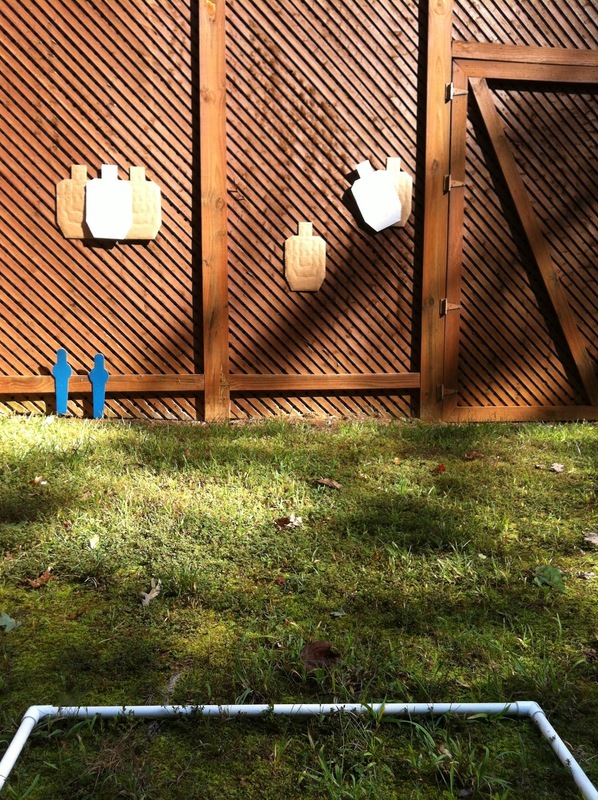 I've set up a few different scenarios in my back yard, stapling the targets to the lattice under the deck. Eventually I'll rig up some stands to make the targets freestanding. I suspect as the weather turns colder, I'll make use of my basement. After all, I only need 1/4 the distances I'm simulating. I'm very pleased with the practices I've had with the C&M targets. I still do my stationary dry fire drills, but have added some more variety, and fun. Even though the match season is winding down, I'll have a interesting variety of dry fire drills to work on while preparing for next Spring.